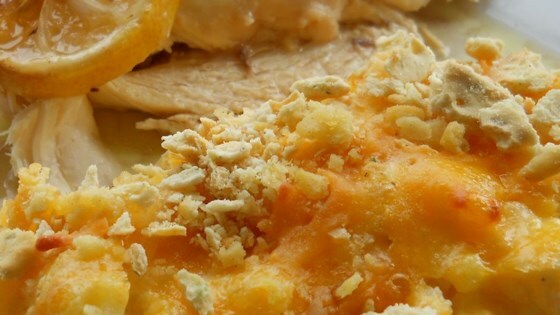 "Cheesy and delicious, this hash brown casserole has a crunchy topping." In a large bowl, combine hash browns, 1/2 cup melted butter, cream of chicken soup, sour cream, chopped onion, Cheddar cheese, salt and pepper. Place mixture in a 3 quart casserole dish. In a medium saucepan over medium heat, saute cornflakes in 1/4 cup melted butter, and sprinkle the mixture over the top of the casserole. Bake covered in preheated oven for 40 minutes. This creamy potato casserole with a crispy crust is great for brunch or dinner.